Welcome to the November Carnival of Breastfeeding! 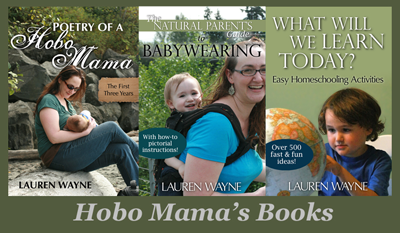 This is my first month participating, and we're all reviewing books and media on breastfeeding, birth, and parenting. Be sure to check out the other carnival entries at the bottom of this post! Compare current United States parenting culture -- where babies spend much of their days in plastic car seats and strollers, sleep in a separate bed in a separate room alone at night, and, if breastfed at all, usually are weaned to formula and solids by 5 months -- with the !Kung San hunter-gatherers of Botswana, where babies are worn on their mothers' hips, sleep with the tribe at night, and breastfeed on average every 13 minutes, for 3+ years. 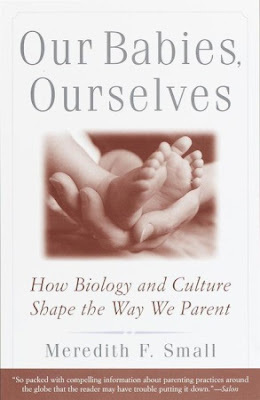 That's just what Meredith F. Small does in Our Babies, Ourselves: How Biology and Culture Shape the Way We Parent -- give fascinating comparisons of the general parenting culture in a continuum from the !Kung San to the U.S. with several stops in between. Small writes not just as an anthropologist, wanting to observe and record human behavior and how it relates to our biological and evolutionary roots as mammals, but also from an ethnopediatrics perspective, which seeks to advise us as parents how to integrate babies' innate needs with our culture in an infant-appropriate way. There are no absolutes in this field, as there are no absolutes in parenting each unique child within each unique culture. Small reflects this in her book. Each culture has elements that conflict with what our species' young were designed to expect, some more than others. Even in the attachment-oriented Gusii people of East Africa, for instance, mothers wean abruptly by coating their breasts with bitter herbs and ignoring or punishing their children's cries. Other differences in culture are less ethically charged but are associated with what each culture values, either in children or in adults. Subsistence cultures with a high infant mortality rate might focus solely on preserving their babies' lives, for instance, whereas more affluent cultures have the luxury of focusing on goals of later development. American mothers talk to their young at a high rate, frequently in the form of questions, out of a belief that this will help them develop the verbal and cognitive skills prized in U.S. culture, whereas the Gusii think such one-on-one attention will create a self-centered adult who is not able to conform obediently to the collective. Neither culture is "right," or perhaps both are, in that each way of childrearing produces adults able to fit into the culture at hand. For me, Our Babies, Ourselves was a fascinating look into other cultures, in the present and throughout history. In fact, it's inspired me to read more anthropological books on parenting -- I've already had recommended to me Mother and Child: Visions of Parenting From Indigenous Cultures and A World of Babies: Imagined Childcare Guides for Seven Societies , so stay tuned for further reviews! As an attachment-oriented parent frequently at odds with the mainstream parenting culture here in the United States, I found Our Babies, Ourselves both to validate many of my current practices, such as sleeping with my baby, breastfeeding on cue, and carrying him throughout the day, and to challenge me to live up to what I believe are the ideal conditions for my baby, insofar as I can fulfill those needs: Since reading about the !Kung San (no, I don't know how to pronounce exclamation points, although here's a clue), I've been trying harder to read his signals and encourage him to breastfeed as often as he wants, even if it's been only 13 minutes since the last feed! It's also pushed me to examine deeply ingrained beliefs I didn't even know I had because they were so bound up in my cultural perspective, such as my culturally prescribed need to talk to my baby constantly and even my assumption that babies require a great investment of resources in terms of time and money, that I am primarily the teacher of my baby, and that the goal of parenting is to produce an independent adult in a separate household. Compare this with other people groups' view that children are a resource in themselves who add to the family's fortunes and are expected to remain connected even into adulthood. I might sound hopelessly naive for saying this, but Small's overview of these fascinatingly divergent cultures really struck me with how differently each people group even thinks about parenting, much less practices it. It's not that I need to change every aspect of my parenting that's culturally informed -- but I think it's healthy to stay aware of those areas and intentionally choose which paths to follow. Small acknowledges this disparity between human infant need and cultural practice: "Nowhere is the slippery slope between what nature might compel and what actually happens more apparent than in the arena of infant care." This book, with its careful research and continual insights, gave me inspiration to be more like the mammal mama my baby needs, questioning my cultural assumptions as I live within them. Check out the other participants' reviews in the November Carnival of Breastfeeding. I'll be updating this list throughout Monday and Tuesday as the entries are posted. On School Street looks at Blindsided by a Diaper: Over 30 Men and Women Reveal How Parenthood Changes a Relationship , "a collection of essays that examine parenthood from every emotional angle"
James and the Giant Moose reviews Having Faith , "one of [her] favorite books of all time ... [and] also one of the scariest"
Why do we push our babies out of the nest? Simple housecleaning: I love you, vinegar!